bomb destroyed the Chichester pub which was on the corner of Windmill Lane and Evelyn St. 1943. It revived the curiosity I always felt when I passed this building 80 years ago. It looks similar to the houses next door, but had an industrial gate on the ground floor, and no windows.....just an open space above the door. The house next door is I believe No. 2, and I know who occupied it between 1930 and 1940. An old map from c.1900 suggests that there may have been a way to access the school from W.L. at this point. I have looked in several Directories going back to 1880 but can find no reference to a business at this location. My only guess is that it could have been a house, later converted to a loading bay for horse-drawn carts. Anybody know? my grandparents (Cyril and Rose Burrows ) lived on the corner a few houses down. Their back garden was bordered by the school boundary wall. Maybe the industrial gate was a side entrance to the school Who knows. Its all gone now. Looking at photos of old Deptford on google,i was inturigued by a picture of a bombed shop in Windmill Lane. 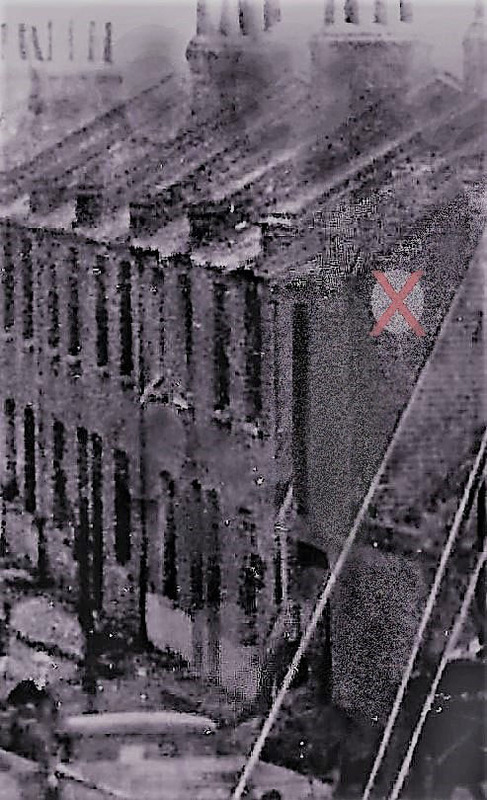 I couldnt work out its location and was beginning to think it may have been a mistake when, on enlarging the frame, in the distance the Windmill Lane Level Crossing can be seen and beyond, the gates of the Victualling yard. The shop must have traded by the Surrey Canal next to the steps of the Surrey Canal Footbridges and after (or during) the war the site became the factory of Mussellwhites who made distemper (a type of emulsion paint) my mother worked there after the war part time. The row of 4 terrace houses by the shop survived the war and a terraced row almost exactly opposite also survived. My family moved into an upstairs flat in the middle house no 61 in 1948/49. Apart from Jones's Corner Shop in South Street, all of the buildings in the photograph on both sides of Windmill Lane up to the yard were destroyed including Swarves of Grove Street including The Britania opposite Dudmans Dock and the Evelyn Arms opposite the Victualling Gates. Hello Anonymous (Sep 2018 21:19) I was intrigued by your post mostly because I lived in No 61 Windmill Lane upper flat, until 1940. I have not seen the picture you describe,and would be grateful if you can tell me where I can find it. I have been looking for any pic of that part of WL without success. I can tell you that Musselwhites were at that address before the war certainly in 1930. If they were not there in 1940, I wouldn't be here to tell the tale! My grandmothers sister was living in No 61 in 1948/9 Her name was Alice Webb, maybe you knew her. Like to hear from you. Hello Ron King im Alan Parish ( anonymous) I was really pleased and surprised on reading your post to find someone who actually lived at the same address number 61. Do you remember the shop that I believed was by the steps of the foot bridge crossing the Surrey Canal during the war? If it wasnt there , ive got it completely wrong. Musselwhites also had a factory/yard behind our row of houses, the entrance was in Sayes Street. It must have been about 49/50 when we moved into number 61 ( I was about 1 years old) and Alice and her mother Mrs Webb had the ground floor flat. We shared the house (and outside toilet) till we were all relocated mid 1963 to make way for the Pepys Estate. Alice and Mrs Webb had relatives in the ground floor flat next door. I cant recall first names but for as long as I knew them Mr Webb owned a motor bike and side car. No one else on our side of the Surrey Canal in Windmill Lane owned a vehicle of any kind. Mrs Jones who ran the corner shop cross Sayes Street had a car but she didnt live there. The photo of the bombed building is on google search engine (Windmill Lane Deptford). It is covered by yellow spots to stop piracy I suppose I have tried fo purchase the picture but got worried about security etc. There is a terriffic aerial photo of the railway wharf and if enlarged you can make out number 61 and the nissen huts that replaced the bombed houses on our side of Windmill Lane. These temporary had electricity and bathrooms and were surprisingly comfortable. We still had gas light, outside toilets and tin baths hanging from the back yard fence. They were eventualy relocated leaving vast areas of bomb sites for us kids to play on and it was some years later that we were moved out. Hope to hear from you again. Alan.